I sprained my ankle last year but still have ankle pain, especially when playing sports. What can I do? Chronic ankle pain is a problem that can occur following single or multiple trauma events to the foot/ankle structures, most likely a ligament sprain. Anyone who has played sports or even walked on uneven terrain has probably experienced a lateral ankle sprain. Medial ankle sprains are less common due to ankle joint structure, strength of the ligament, and the mechanism of injury required to cause damage. While ligaments are strong structures, once injured or overstretched, they lose some of their protective properties. Multiple sprains can cause ligament laxity or a slightly unstable ankle joint. This chronic instability can irritate the surrounding structures, causing pain. Ligaments cannot be tightened up with exercise, however, improved function and strength to muscles surrounding or attaching to ankle bones can assist in decreasing excessive motion. Proprioceptive/balance activities can improve muscle efficiency and effectiveness in stabilizing the ankle joint. Foot orthotics and ankle braces can also be used in conjunction with exercises to correct ankle/foot alignment and provide added joint stability. It is important to be evaluated by a physical therapist or your doctor to assess joint mobility, strength, and dynamic stability to determine the best course of treatment. 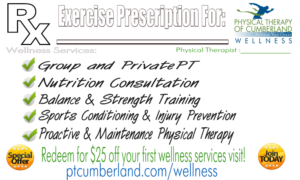 If you have further questions on this topic or any other injury, please call Physical Therapy of Cumberland at 333.9787.